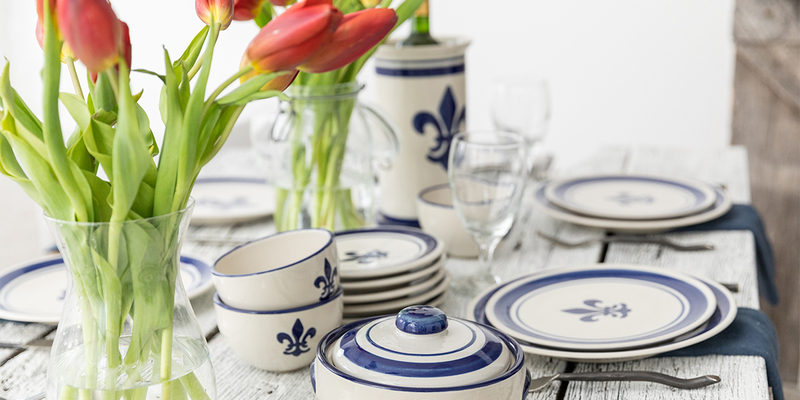 Collections - Blue Fleur de Lis - Page 1 - Stoneware & Co. In French, fleur means flower, and lis means lily. The fleur-de-lis is a stylized lily or iris that is used as a decorative symbol often associated with the French monarchy. Louisville, named for France’s King Louis XVI, is one of five cities and two states that have the fleur-de-lis in its flag or seal. Here, the design takes beautiful shape with a slightly raised, shiny blue glaze. Hand-painted bands of blue and a glassy white overglaze lend further distinction and elegance to the pattern, a perfect symbol of Louisville, Kentucky.